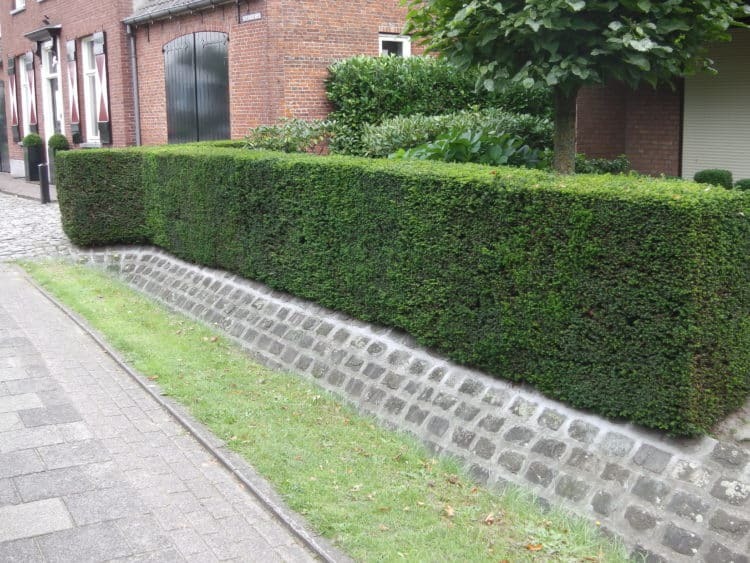 Low Maintenance Hedges - Easy To Maintain Hedging Plants And Shrubs. A varied and interesting selection from our massive range of hedging to suit all types of purposes but with one thing in common - none of these plants will get out of hand and so are easy to maintain. Sometimes only the fastest growing hedge will do, but in many other situations it can make a lot of sense to choose a hedge with more moderate growth. This can save a lot of trimming later on - and you will have a much smaller volume of clippings to dispose of! Low maintenance hedges – There are certain occasions where a fast-growing plant is required for hedging to quickly cover or camouflage an area and others where slow growing plants are a must for low border hedges but generally speaking plants with a steady medium growth of around 30cm per year are preferable for the average gardener to keep trimmed well – low maintenance hedges. As an informal hedge Deutzia Scabra is a very pretty summer flowering shrub, easy to grow and maintain, whereas at the other end of the spectrum for prickly hedging to deter intruders there is Berberis hedging (both Green and Purple) and Blackthorn with its early spring flowers and later the sloe berries. 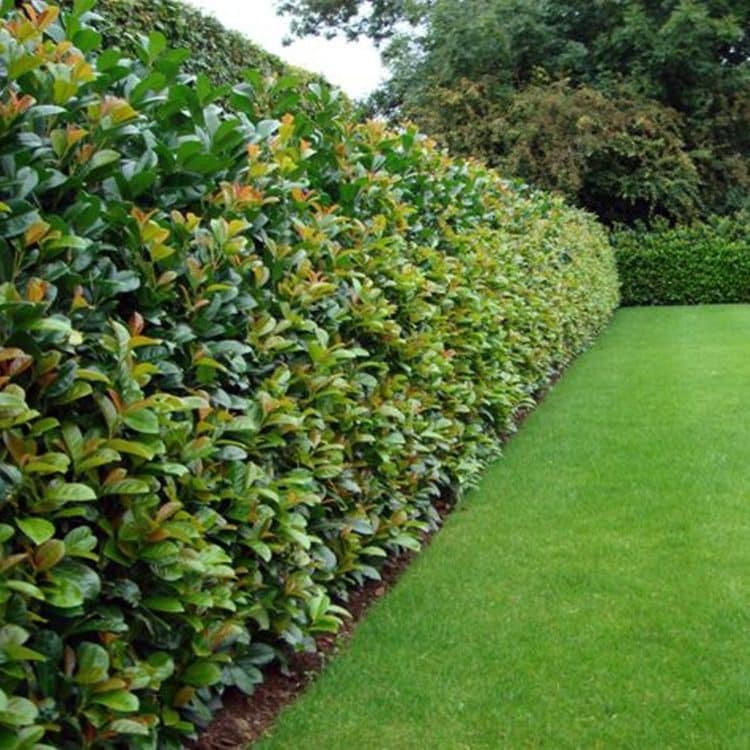 For evergreen low maintenance hedges, the larger leaved Laurels, Cherry or Common Laurel and Caucasica Laurels are perfect for giving good dense cover, of all the Laurels however the Etna Hedging Laurels and Compact Laurels are the easiest to maintain. The traditional Leylandii conifer hedge is of course way to vigorous to be regarded as a low maintenance hedge. There are however several excellent alternatives including the king of hedges – English Yew hedging plants. Also the beautiful Thuja Smarage hedge makes an excellent slower growing conifer hedge. Thuja plicata ‘Atrovirens’ is also a slower growing alternative to Leylandii that can be clipped just once a year. All of these conifers will regenerate if cut back hard into the old and unpromising brown wood, as useful trait if the hedge does become overgrown. There are several semi-evergreen plants with medium growth rate which most of the time will retain their foliage through the winter losing them only to very harsh winter conditions but regenerating the leaves very quickly in spring. All make excellent low maintenence hedges. Plants such as Hypericum Hidcote, Cotoneaster Simonsii and Green, Golden and Wild Privet would all fall into this category. Other plants quite often found in a Mixed Native Hedgerow to attract wildlife, such as Guelder Rose, Alder Buckthorn and Common Buckthorn, Bird Cherry and Wild Crabapple would also be eminently suitable if a moderate rate of growth is required. For more flowering varieties look no further than Flowering Currant hedging, Wayfaring Tree and the more moderately growing Scotch Rose or the fragrant Rosa Rugosa. If you need any further information about our low maintenance hedges or any other plants, please call our experienced sales team on 01580 765600, they will be pleased to help.